These can all lead to improved body performance and stamina. A unique source of ENERGY, ENERGY, ENERGY, starting at the cellular level - where it counts!! The Vitalizer Plus creates structured hexagonal water packed with oxygen, energy, and a raised pH. The long term health benefits this machine provides can not be overstated! This is probably one of the most important pages you will read devoted to drinking water. The powerful information laid out below will illustrate why it may not be sufficient to just obtain PURE drinking water. In order to realize the full benefits of water at the cellular level in the body, additional functional water characteristics must be present for optimum benefits. Not only are most naturally occurring water sources polluted these days, but they also do not have the same functional properties as highly "structured water". The Vitalizer Plus™ has been developed to allow you to now produce both PURE and HEALTHY water easily and inexpensively in the convenience of your home or office. Let's talk about structured water. "...the core of each DNA double helix is a column of water clusters...Small hexagonal water clusters fit into and through the hexagonal channels in cell membranes and inside the cell, swiftly delivering their goods and removing wastes." (Water as a Communicator - Institute of Heartmath Research Center). "...Aging is a loss of Hexagonal Water from organs, tissues and cells, and an overall decrease in total body water. Replenishing the Hexagonal Water in our bodies can increase vitality, slow the aging process, and prevent disease". Molecular Water Environment Theory: - Dr. Mu Shik Jhon. How Does The Vitalizer Plus™ Work? It uses movement. The Vitalizer Plus™ technology incorporates basic principles utilized in nature, to create a special life-enhancing water your body will love. In nature, this life-enhancing water begins with rain or snow which is naturally energized and if not polluted with atmospheric acids, is often highly structured. Water naturally forms vortices when flowing around stones and other objects, oxygenates itself in the vortices and by flowing over stones and little water falls, receiving far infrared enhancement from the sun and electromagnetic stimulants from granite type rocks and the earths natural magnetic field. Therefore, in the Vitalizer Plus™, a highly powerful vortex, electromagnetic fields and ceramic materials emitting FIR energy emulate the natural phenomena which create healthy water in nature. The end result is a super wetting hexagonal structure carrying extra oxygen, energy and ionic minerals deep into the cellular environment in seconds. NOW, YOU CAN CREATE THE SAME LIVING WATER IN YOUR OWN HOME WITH THE VITALIZER PLUS™! (1) Structure water - powerful magnetic and infrared sources reduce the size of individual water clusters, creating Hexagonal Water for more efficient and rapid penetration into the cells of your body. (2) Increase Oxygen - turbulent forces create a powerful and visible vortex, increasing the amount of oxygen in your drinking water up to 30%. (3) Add selected, "stucture-making" minerals/ions - a unique mineral core, comprised of coral calcium, zinc, lithium and others contribute to the structuring of water. NOTE: The water needs to be purified by steam distillation or high quality reverse osmosis processes beforehand, to remove "structure breaking" minerals/ions such as chlorine, potassium, aluminum, etc.). A select set of ionic minerals are known to enhance the construction of hexagonal water. These minerals occur in very small amounts and help "organize" the water molecules into tightly packed arrangements which serve to protect and enhance cellular health (see pictures below). 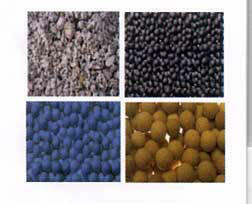 Commonly occurring minerals can be grouped into "structure making" or "structure breaking" categories as listed below. In order to ensure that the final product has the correct mineral "balance", the water is first purified by either steam distillation, or a high quality reverse osmosis system, or a high quality water filter. The minerals are then combined in the vortexial water movement in the Vitalizer Plus™. Calcium, sodium, zinc, iron, silver, copper and others help to convert water into hexagonal water while potassium, chloride, fluoride, aluminum, sulfide and others destroy the hexagonal structuring of water. The process is similar to erasing unwanted information from a computer disc before placing new information on the disc. Note: ΔEww is the interaction energy (kiloJoules/mol) between the water molecules in solution. Healthier Cells - supported by tightly bonded, hexagonal water clusters - created by "structure making" ions (see above). Pollutants and toxins are unable to bond with water molecules and create toxin accumulation and cellular problems. Unhealthy Cells - characterized by loosely bonded, pentagonal or unstructured water clusters and "structure-breaking" ions (see table above). Pollutants and toxins can easily bond with water molecules and create toxic accumulation and cellular problems. The application of pulsed Nuclear Magnetic Resonance (NMR) techniques in the area of biological systems has increased, and such NMR studies can provide valuable information about the kinetic properties of water, and indicating that NMR relaxation times reflect the reduced mobility of hydrated or bound water. Data using Magnetic Resonance Imaging (MRI) has become an accepted method to check on the density/clustering of water molecules. The (half) line widths indicate the size of the molecule or water cluster as determined by its rate of rotation or relaxation time. Normal tap water will measure around 120 Hz. This higher number indicates that the water molecules have "clumped together" around selected types of "structure breaking" ions and occur in large clusters (dozens if not hundreds of molecules per cluster) thus making it extremely difficult for the group of molecules to penetrate the cellular membrane (see figure below). 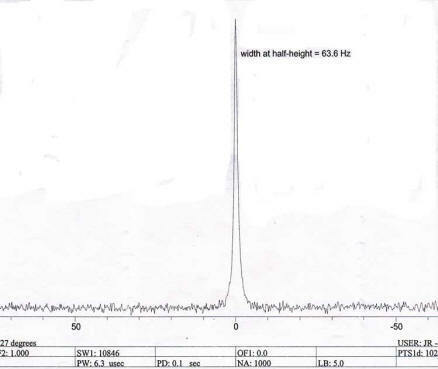 On the other hand, NMR Imaging has shown the half line widths of the Vitalizer Plus™ water clusters are as small as 63 hz. This indicates that from a statistical point of view, the water is indeed hexagonal in formation, containing on the average 6 water molecules per cluster. Few if any bottled concentrates, natural or bottled waters are found with structures this small. 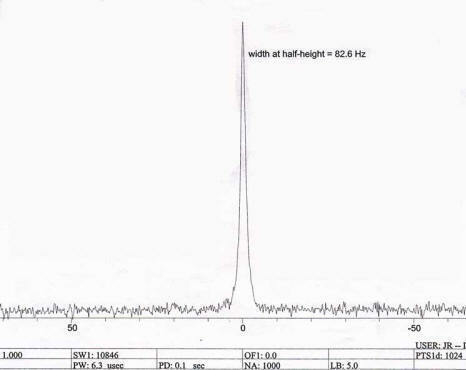 Water Type Width of NMR(Hz) Dissolved Oxygen - mg/l Calcium Content - mg/l pH @ 20 deg. Cent. For those of you who are currently using or considering using steam distilled water for your drinking purposes and are interested in seeing what structural enhancement of the distilled water is possible using the Vitalizer Plus™, these pictures are for you. The observations are very dramatic and will give you an idea what the processes of electromagnetics, structure-making ions and the vortexial action in the Vitalizer Plus™ will produce, even on highly pure and partially structured steam distilled water. LABORATORY COMPARISONS OF HIGH PURITY STEAM DISTILLED WATER AND THE SAME STEAM DISTILLED WATER AFTER BEING PROCESSED BY THE VITALIZER PLUS™. Pictures at left are high purity Steam Distilled Water Pictures at right are high purity Steam Distilled water processed by Vitalizer Plus™ for just 9 minutes. When you drink Vitalized hexagonal water, whether from that rare clean natural stream or from your Vitalizer Plus™, you will notice that it does not sit in your mouth or in your stomach. Rapid or near-instant absorption is accomplished by the hexagonal clustering process. Larger and unorganized clusters of water molecules have a more difficult time penetrating the cellular membrane; hexagonal, organized water clusters penetrate the membrane far easier, as illustrated in the Bioelectric Impedance Analyzer data immediately below the following figure. RJL Systems' Bioelectrical Impedance Analyzer (BIA) is the only device approved by the FDA to measure hydration and monitor Intra-Cellular and Extra-Cellular water exchanges. 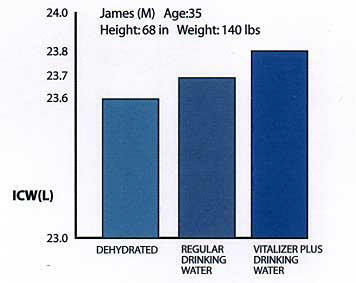 The results of tests conducted on the Vitalizer Plus™ water are illustrated below where a substantial increase in Intra-Cellular water is experienced for an individual with normal body weight, height and age. Results may vary depending on individual water usage, weight, height and age. Properly clustered water will provide the Intra-Cellular water enhancement illustrated below. Improperly clustered or unclustered water is less likely to hydrate cells properly and may result in the deficiencies illustrated in the example below. Most people think we take oxygen only through the air we breathe. However, foaming oxygen increased by vortexial action and magnetized water (as with the Vitalizer Plus™) activates the kinetic energy, stimulates the mucous membrane while passing through the stomach, small and large intestines, and promotes blood circulation to the blood vessels. The oxygen also takes out the toxic gases and wastes in the intestines, providing a clean intestinal environment as well as a clear blood stream. The brain accounts for 20-30% of total oxygen consumption in our body. Lack of oxygen to the brain may cause one to be lethargic, have a lower attention span, and over an extended period of hypoxia will certainly lead to dementia and eventually death. 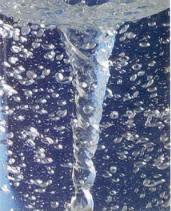 When exposed to a vortex, oxygen can be bonded to water molecules. Such an effect can be observed in mountain streams where millions of small, swirling vortices capture and bond oxygen into the passing water. In the Vitalizer Plus™, a powerful vortex increases the oxygen content of the water. 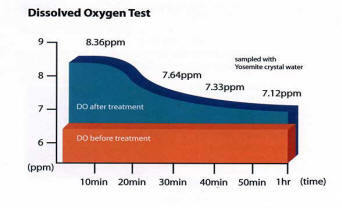 A 30% increase in dissolved oxygen over even good quality bottled water can be realized as illustrated below. To experience the greatest benefit of this increased oxygenation level, the Vitalizer Plus™ water should be used within 20 minutes of preparation. An increasing number of nutritional experts are recommending the use of less-acidic diets as well as water which is slightly alkaline. The Vitalizer Plus™ gently mixes a select number of structure-making ionic minerals into the purified water and raises the pH as illustrated below. Good quality Spring, HIGH quality filtered, steam distilled and reverse osmosis waters will all benefit from this increased pH level. The use of a simple flower can sometimes demonstrate the efficacy of Vitalized hexagonal water. 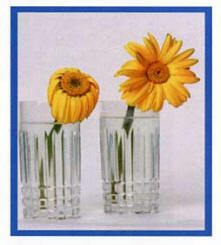 Using two, equally mature, Gerbera Daisies, one was immersed in filtered water, the other was placed in the same filtered water which had been processed by the Vitalizer Plus™. After 7 days, the daisy in the Vitalized water was still vibrant and fresh; the other, as shown at left was limp and wilted. It is very important to put steam distilled or high quality multi-filtered water into the Vitalizer Plus™. Filtered or spring water may be used, but possible contamination (chemicals and structure breaking ions are almost always present, making this less desirable. Under no circumstances use unfiltered tap water. After processing the water, store the vitalized water in a separate container. GLASS should be used and not metal or plastic. Twenty-seven minutes of processing provides a balancing therapeutic water that allows the body to detox in a comfortable manner in most instances. Two 27 minute cycles brings the water to a highly aggressive therapeutic detox range that should only be used for health restoration or drinking a couple of ounces at a time several times per day, in addition to more water at lower levels to keep properly hydrated. (see caution below). Higher levels, like three or four twenty-seven-minute cycles, have been used to aid the body in relieving dental pain by taking a tablespoon and "swishing" it in the mouth before swallowing. This should not replace the advice of your health care provider. Half ounce to one ounce ingestion several times per day may aid the body's system in dealing with infections and pathogens, but no claim can or is made here. We have found that hexagonal water can produce a variety of life-changing results for different people. However, we encourage you to start SLOWLY, starting with 6 ounces of hexagonal water produced in the 9 minute cycle (preferably with an empty stomach) the first couple days. Once in the AM and once in the PM. If you notice little or no change, increase intake by 6-8 ounces every other day until you are drinking hexagonal water exclusively. It is widely recognized that the herxheimer reaction is caused by the release of toxic chemicals (endotoxin) released from the cell walls of dying bacteria due to effective treatment. This, in turn, results in a response from the immune system which manifests the symptoms experienced by the individual being treated. Remember, with the enhanced absorption characteristics of the hexagonal water, cleansing action which may normally not be taking place may commence - this is a good thing, ridding your body of accumulated toxins. The cleansing experience may be what you will be experiencing. THANK YOU for taking the time read about this great device. If you have any questions, please let us know! Combine a top quality steam distiller system or high quality water purification system with the Vitalizer Plus™ and you still pay less than many of the questionable water ionizers or gimmicks now on the market. Mineral basket replacement optimizes performance. Replacement interval is estimated at 4-12 months, depending on usage. A front panel monitor lets you know when 200 minutes of the 4000 minute mineral basket lifetime is available. Estimated cost per batch, based on regular replacement of mineral basket = 20¢. Batch (0.6 US gallon). WATER FILTERS | Water Filtration Methods | VITALIZER PLUS Structure your own water! Disclaimer: These statements about The Vitalizer Plus, magnets, structured water, etc... have not been evaluated by the Food and Drug Administration. The information contained here about water filters is not intended to diagnose, treat, cure, or prevent any disease. Suggestions and ideas presented in this document should not be interpreted as medical advice, meant for diagnosing illness, or for prescriptive purposes. The information in this document is not to be used to replace the services or instructions of a physician or qualified health care practitioner. 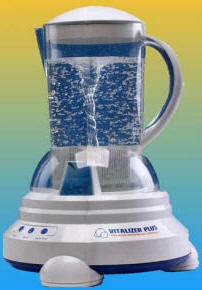 The Vitalizer Plus structured water maker.